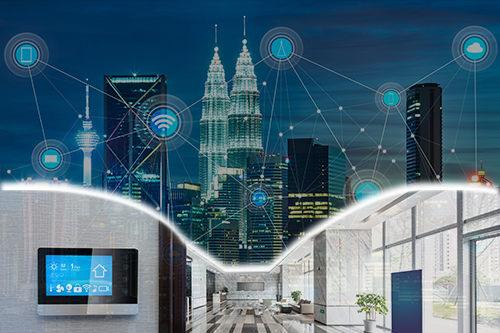 Amphenol Industrial Products Group, a global leader in interconnect systems, offers a wide range of circular connectors, terminal blocks, shielded connectors and plugs for the smart building market. Designed for optimal performance in the most demanding environments, Amphenol has a solution for nearly every smart building application. Amphenol’s smart building products, which are distributed by several different divisions of the company, are designed to work with any structure that uses automated processes to automatically control the building's operations, including heating, ventilation, air conditioning, lighting, security and other systems. • Amphenol LTW (ALTW) offers a wide range of reliable waterproof connectors to meet harsh environment specifications, including the X-Lok push-lock mechanism series and a reversible plug - USB 3.1 Type-C connector. Additionally, ALTW provides more options for protective vents. For lighting applications, SSL (smart solution in lighting) is the best solution for eliminating field wiring. • Amphenol’s Aquarius series, from Amphenol Sine, are lightweight plastic waterproof (IP67/69K in mated condition) connectors ideal for harsh environments. • Amphenol Anytek offers TJ series, OQ series and HA series terminal blocks for small business. • Amphenol Sine Systems (Sine) microBOSS™ M12 factory molded cord sets provide a space saving and highly reliable sensor connection to withstand harsh environmental conditions and temperatures for a wide range of applications. • Amphenol Industrial Operations (AIO) offers power and signal connectors, including the Micro-B™, UPT, Amphe-Lite, Max-M12 and LPT.